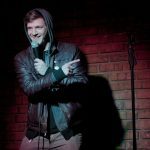 Brett Mercer is a Detroit-based comic and producer who quickly wins over crowds with his quick wit, comfortably anxious stage presence, and irreverent disposition. Audiences are wow'd by Brett's ability to rework and poke fun at tropes, templates and clichés, both on stage and in a Biography. With a strong sense of irony, 26 years experience of dodging uncomfortability by way of humor, and a strong knack for not giving a darn, it seems the only thing Brett Mercer takes seriously is his drive to nurture a flourishing local comedy scene. Opened for Johnny Pemberton and Josh Fadem at the Magic Bag in Ferndale. Co-Producer/Host of Chuckie Finster, a monthly comedy show at Recycle Here! in Detroit, MI Producer/Host of Standprov at Go! Comedy Improv Theater. Host of the now defunct Standprov Open Mic at 7 Brothers. Worked at the Holly Hotel, and Mark Ridley's Comedy Castle. Once was booked to work at the South Lyon Hotel. It burned down recently, but I still count it as a credit Hung out with Todd Glass twice.